Readers unfamiliar with Maine might think I’m exaggerating when it comes to the horror of March in northern New England. Au contraire! And I have the pictures to prove it. This was the view this morning from my office window. Here is another one from a slightly different angle. 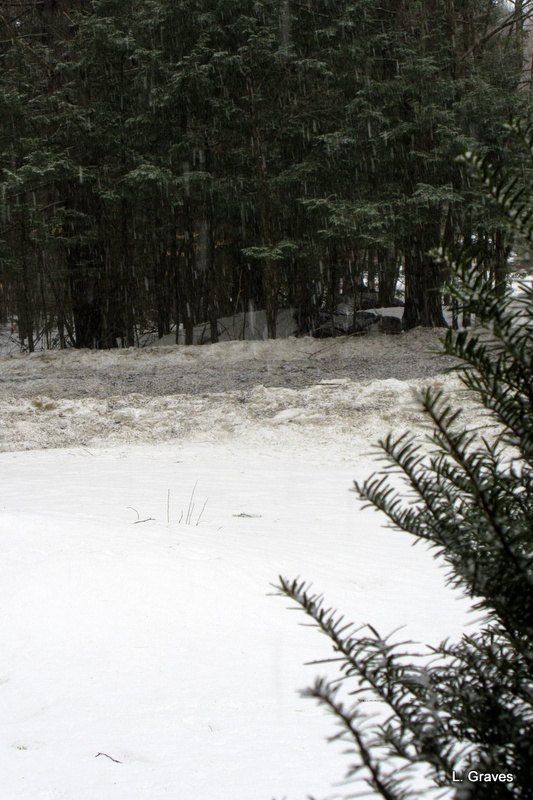 Note the spitting snow and the hard, dirty snow banks. 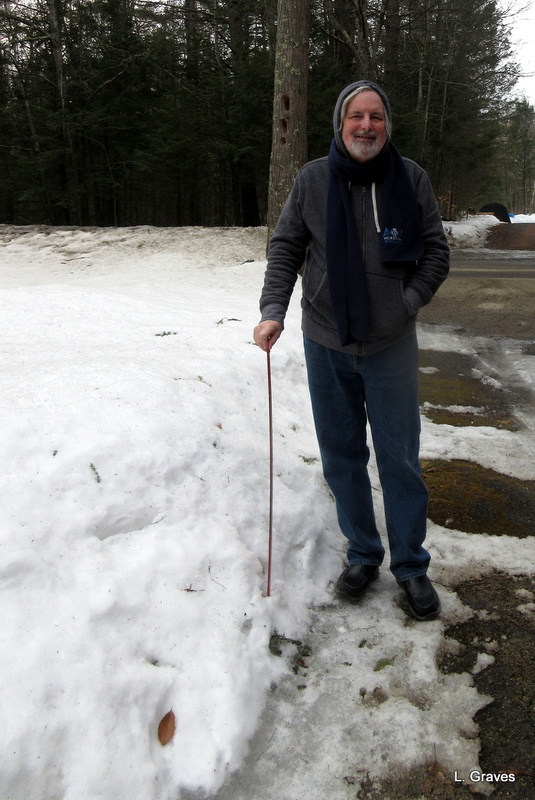 Yesterday, Snow-Gauge Clif did his measuring duty with his trusty red yard stick. Hats off to Clif for looking so cheerful. In the backyard, Clif doesn’t look quite as cheerful. Maybe it was the penguin-walking he did over the icy paths to get there. Fortunately, he didn’t fall and break anything. Despite all the griping, I do have to admit that some progress has been made in the driveway. 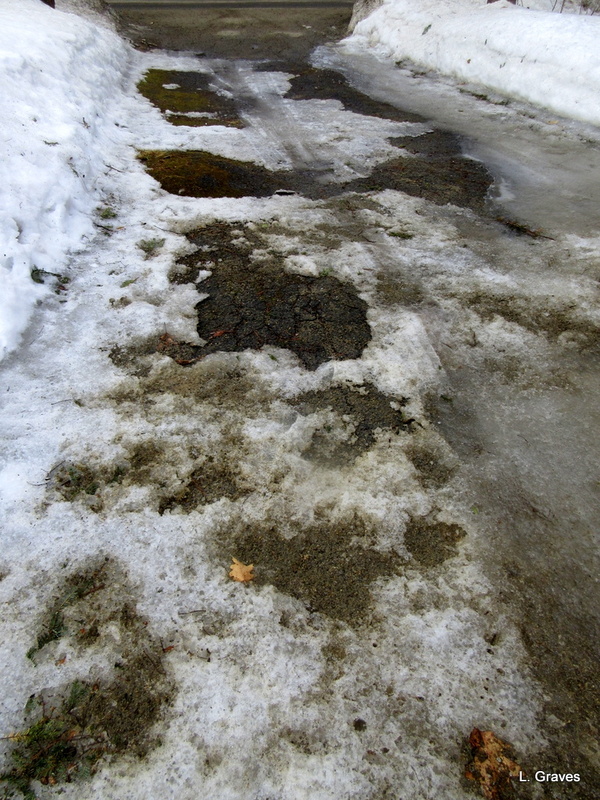 There are actually bar patches of tar amid the ice and snow. So onward, ho! April is just around the corner, and as I sit at my desk and write, I can hear a male cardinal singing his sweet song. Spring is coming, albeit ever so slowly. Yes, I got the mail out of our mailbox sloshing through a half inch of slush! Glad you made it back in one piece! I sure don’t blame you! We really are seeing spring here in Wales… it’s grey today, but there are lots of flowers appearing and the birds are all getting amorous! Hang in there! Spring is coming soon to your neck of the woods. Here on the west coast it arrived very suddenly, practically overnight, just as we were about to give up together! Best of luck! Many thanks! In Maine, March is always a misery, but this year it’s outdone itself. Yes, so I understand. My brother lives in New Hampshire, and if weather conditions there are any indication of what it is like in Maine……good luck! Hope spring comes to you soon too! You say ‘Hats off’, but I think Clif is very wise for keeping his on. 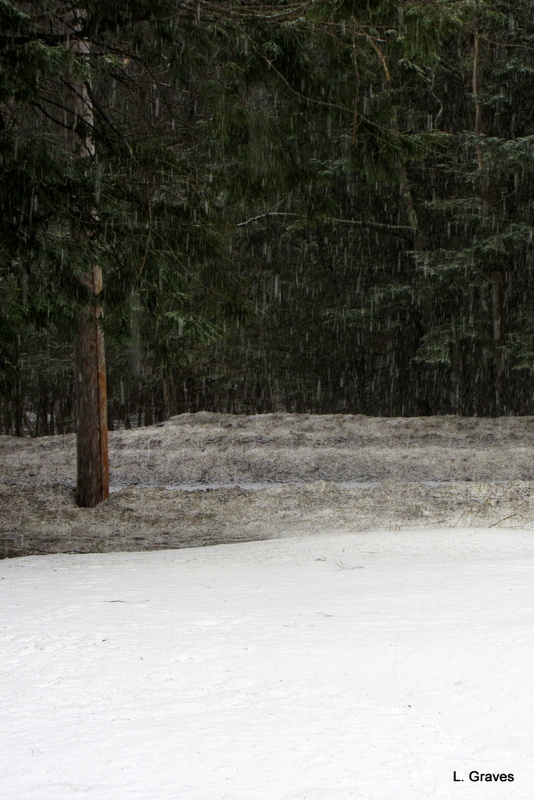 This is a tough time to be a New Englander, forever waiting for the snow to melt. Hang in there! I feel your pain! Haven’t been out much – we all got ill — but I was delighted to go out yesterday and find the temperature quite mild. Today its blustery again, and we are told there will be snow in the days to come. Tell that to the birds! They’re singing their spring songs! What a bore. Still, it can’t last forever….can it? No. Spring is coming, just ever so slowly. 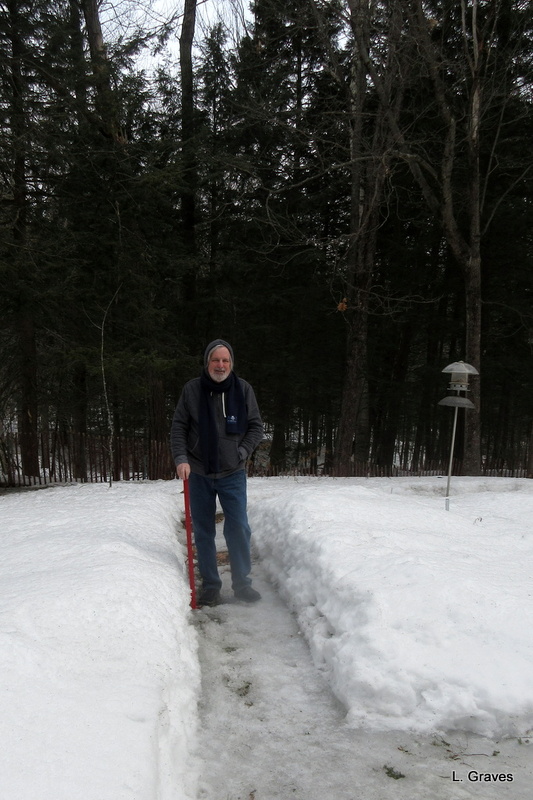 Mainers always get antsy in March. Snow, rain, wind today – I feel your pain. John and I went through our seeds tonight. At least that seems like progress. Always perks up a day. Mud season is just around the corner. The ice & sluggy snow looks very tricky for walking,I wonder how elderly folk living alone cope during March? A lot of elderly people head south for the winter. Those who don’t proceed very carefully. Yup–super ugly here, too. The endless winter . . . Awful. Has Clif lost a glove? Sharp eyes! No, he just figured it was warm enough to go outside without gloves. Remember, we are Mainers, where 40 degrees Fahrenheit feels pretty darned good. That does look grim! I will stop moaning about our constant wind, grey skies and intermittent rain – March is my least favourite month for sure! Clif does look cheerful; even in the not so cheerful photo he looks cheerful! As a rule, he’s a cheerful guy. I was in your neck of the woods on Friday and was surprised to see how much more snow you have than we do. But today is going to be a gorgeous, sunny spring-is-here day, so perhaps you’ll be seeing the last of it soon. Always more snow in central Maine than there is by the coast. But mud season is here, and spring is coming. Still a lot of snow on the ground, but warm weather is coming.